Star Wars fans defied church protests in Isle of Lewis on Sunday to attend The Last Jedi screenings, The Telegraph reports. Protesters took up signs outside the An Lanntair arts venue in Stornoway, aiming to maintain the holiness of Sundays on the Sabbatarian isle off the west of Scotland. Fans of the franchise were warned by picketers they were breaching God’s law by seeing the latest episode of the Star Wars saga, the first film to be shown in a public cinema on the Isle of Lewis on a Sunday. One protestor, the Rev. David Fraser of the Free Church of Scotland (Continuing), held a cardboard sign telling moviegoers “remember the Sabbath day [to] keep it holy.” The same message was represented by an unidentified woman nearby. Attendees should “repent and be converted that your sins may be blotted out,” according to Fraser. “The island was traditionally staunchly Presbyterian and its observance of the Sabbath was so strict,” The Telegraph writes, that at one time even park swings were locked down at dusk on Saturdays. The only theater on the Isle of Lewis, the sole screening sold all 183 of its available tickets. The venue will open on the last Sunday of the month through March as part of a trial run. The theater will screen Disney-Pixar’s Coco as its Sunday selection at the end of February. “We are making our convictions clear — we are not trying to block people going in, but making clear what we believe in and that they should be seeking their own salvation and God's ways," he added. "Spending Sunday in a cinema is not God's way." "We have been really careful to do this in the least disruptive or offensive way," said David Green, chairman of the An Lanntair arts venue. "It is about a quiet afternoon for families. How we continue, and if we continue, with this will be decided at the end of the trial." Green added none of the venue's staff have been forced to work on a Sunday. "I think it's fantastic. If people don't want to go to church they should be allowed to go to the cinema. I think quite a lot of people to want this to happen," said father-of-two Hereward Proops. The Last Jedi also proved controversial with an Irish Heritage Preservation group who expressed concern visiting Star Wars fans would destroy Skellig Michael Island's history after the ancient island was used to depict Luke Skywalker's hideaway in the new trilogy. 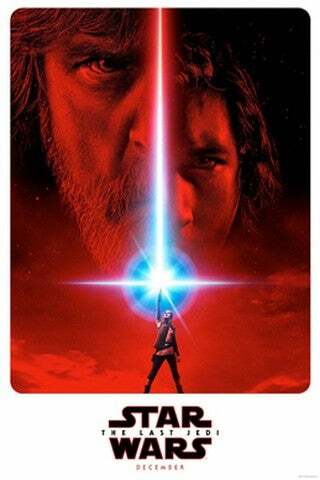 Star Wars: The Last Jedi is now playing and is expected to hit 4K UHD and Blu-ray in March.